The horse’s strong, powerful legs drug themselves forward, and its seasoned hooves slapped through the thin softness of the grass, meeting an unsuspected firmness much too abruptly. The tall bristles of grass scratched themselves against one another like thin strips of coarse paper. The horse lifted its legs enough to move it’s hooves, but not near high enough to stomp the sharp grass. It was thin and weightless, yet it was brittle enough to be firm like thin wheat stabbing the horse’s legs. The horse hung its head with its mane covering its eyes. Never once did it lift up its head or toss its thick, majestic hair away. It only continued to brush its way through the rods of grass, only lifting its feet enough to keep moving forward. It could feel its rider hanging off of it. The knight sat motionless with his legs dangling off the horse on either side. His lance felt heavier and heavier as it tugged down on his arm. He hung his head just like the horse with his glazed eyes watching the horse’s thick, beautiful mane slip off slowly. His helmet mashed his ears and split his head. His armor seemed to pull his shoulders out of their sockets. His shield pulled back on his neck and his head grew heavier by the second. Slowly, the motion that kept these two in sync with the lifeless sway of the grass came to a halt. The knight corrected his vision as he saw the horse’s mane cease its falling. He read it several times. Each word made sense and came clearly, but there was no meaning in the phrase. “Caw!” cried the crow again. The knight heard the sharp cry of the crow much more clearly, and he turned his head to it. The crow looked back at him, then to the horse, then to its left, and finally it stopped looking and came to ease. The knight looked over where the crow had looked. 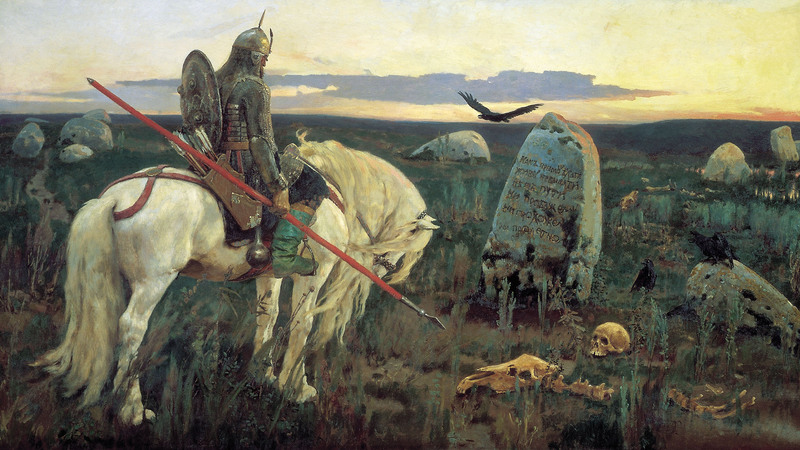 There, before two other crows that had gone unnoticed up until that point, lay two hideous, unnatural landmarks: a human skull and a horse’s skull. “Convenient.” thought the knight, looking up from the gruesome sight. “Caw!” cried the same crow again. It wasn’t any louder than the others. This one however, like the second, seemed much louder than the first as it rang in the knights ears. In fact, this one rang even louder than the second. The knight looked at the crow, which was now looking back at him as well as the horse, and he drooped his eyebrows a bit as he studied it. The other two crows sat comfortably in the same position, looking over at the first crow occasionally, but with a strange indifference. They appeared to be much less interested than the knight, however, they allowed the confusing scene to take place with no argument. Finally, breaking the wait for action, the crow lifted its wings and ascended up into the air, circling the knight in a large, swooping circle. The knight looked up and watched it fly, as did the other crows, although not quite as carefully. The crow circled and circled and circled, slowly and rhythmically flapping its black wings. At last, it broke its circling pattern and flew further off, landing on a stone a few yards away. The knight watched it land with intrigue. He looked over at the other two crows, which looked back up at him with that same peculiar indifference as before. The knight, finally taking control of his body, kicked his legs together gently on the horse’s sides. His feet rippled with numbness. The horse, which had been standing sullen for several moments now, lifted its head and turned it back toward the knight, who kicked his legs once more. The horse, shaking its own numbness from its massive frame, stepped forward with several quick, strong steps. The knight guided it towards the distant crow, which was watching every so often, but with enough disinterest of its own to remain very peculiar. As the knight came closer, it leapt up into the air and flew in a circle, breaking off into a straight flight further toward yet another stone. The group continued on a few yards further and came near the edge of what was now clearly revealed to be a cliff. The knight gripped his lance firmly and lifted it up just a bit to regain control of it. The horse grunted, shaking the gloominess from its eyes, and it threw its mane back across its neck. It had now begun to trot quite wonderfully upon the firm ground. The brittle grass cracked beneath its hooves, and the thin, mossy layer of grass underneath now provided a fair amount of spring, which made the trotting rather pleasant. A gray shimmer caught the knight’s eye as he came closer to the edge of the cliff. It was darker than the stones and not near as grainy. It was flat and dull, and he knew it most certainly looked like iron. And it was. With every step closer he came, he became more sure of it. The wind blew the grass away every few seconds, and after three close inspections, he made a clear discovery. There was also a boot lying in the grass. A green boot, much like the color of the grass, only a shade lighter. He knew it was a boot, as it looked exactly like his own boots. “Caw!” cried the crow, finally landing on the edge of the cliff. It looked up at the knight, then back down the edge of the cliff which was still unseen to the knight. The knight grabbed the horse’s reigns and gave a gentle tug, not so much as to slow it down, but enough to grab the horse’s attention. Finally, as the horse trotted to the edge of the cliff, the knight turned its head to the right and came up parallel to the edge. There, on the edge of the cliff, hung a young, unconscious knight with his ankle locked underneath a thick root. The mounted knight recognized his armor immediately. The young knight was one of his own. He swapped the lance over into his left hand and extended it down towards the young knight’s head. Gently, he slapped the cold spear end on the young knight’s face. The young knight rustled around, finally peeling open his eyes. With a sharp jolt, he jerked his head away from the lance, clearly realizing what it was. He shrieked as he swayed back and forth off the edge, still dangling from his ankle. He looked up along the edge of the frightening red lance, and finally fixed his eyes upon his rescuer. He gasped for breath, struggling to utter the words on his mind. “Sir…” muttered the young knight. The young knight looked up at him for a moment, then dropped his head back down. “I didn’t.” said the knight boldly. “Neither…did I,” said the young knight as he dangled off the edge. “It would appear we chose correct,” said the knight. The young knight laughed silently, sighing to himself. Finally, he reached his arm up for the lance and slowly wrapped his tired fingers around it, gripping it as firmly as he could. The knight smiled as he gripped his legs around the horse and held the lance firmly. “Perhaps that would be wise,” said the knight.